Tomes and Tequila: Tons of Totes! It's been a while since I wrote a shopping post, and as I was perusing one of my favorite sites, Etsy, the other night looking for the perfect birthday gift for one of my dear friends, I realized I have a TON of tote bags on my favorites list! Do I need more tote bags?? My husband would tell you I REALLY don't. But I love them, and I'm always excited when I see one that says something out of the ordinary. 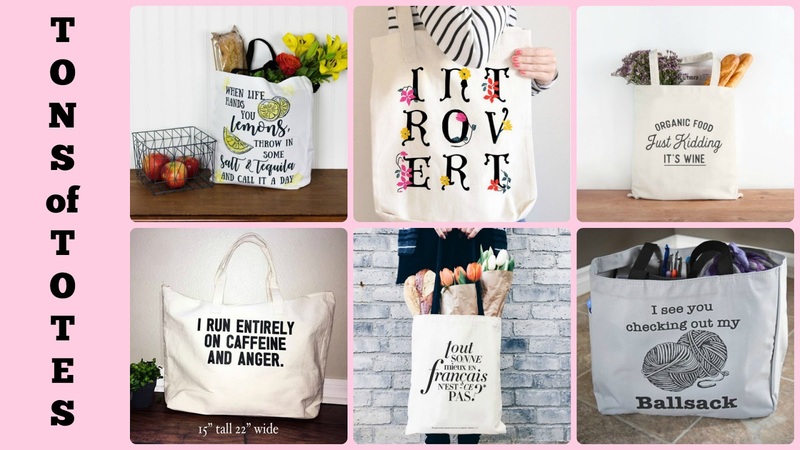 I mean, who doesn't need a tote bag??? So here are a few of the ones that stand out off my dream list. I had to start with a book tote! If you've been a reader for a while, you'll know that Jane Eyre is my favorite classic book. I'm also a fan of the storiarts shop on Etsy. 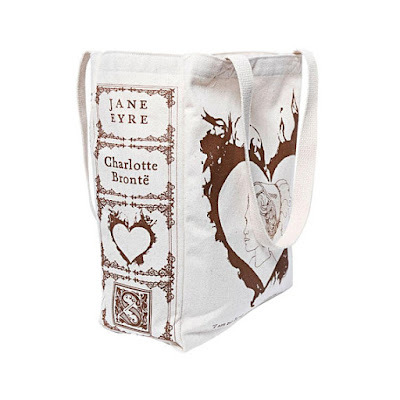 So when I saw that they now do book totes, I actually squealed! The book spine ends, the shape of the tote, everything about this bag makes me happy. You can find it at storiarts for $34. Okay, how could I not put this bag on the list?? It's talking about tequila!! 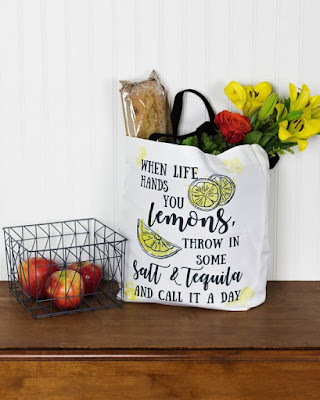 This is the perfect grocery tote, and is guaranteed to make people smile as you're walking around the store. It probably won't look as pretty as this stylized photo from the shop, but I don't see how it could NOT make your toilet paper look a little bit cooler. You can find it at TheTraveledLane for $24. If I say I thought of my daughter when I saw this tote bag, would you think badly of me? Because this tote is zippered, it opens up so many more usage options! You could use this as a gym bag, a diaper bag, that bag you throw in your car with all of your crap when you're super busy. It's really another one that makes me laugh. 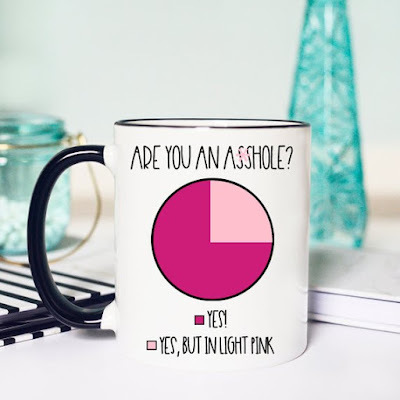 It's sold by SheSquatsClothing for $16.99+. Feel free to tell me that I have an incredibly inappropriate sense of humor, you wouldn't be the first person. I doubt I'll grow out of it, since I'm in my forties. 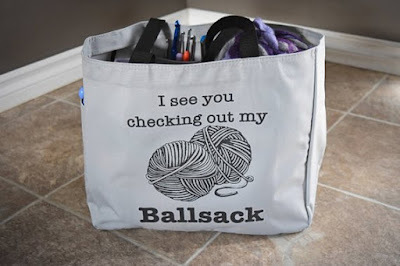 I saw this bag, and I fantasized about the older lady who crochets during my Weight Watchers meetings carrying around this bad boy, and how all of the other older ladies would snicker when they read it. And then I smile. Naughty yarn enthusiasts everywhere can find this at CraftingPastBedtime for $26.87. Another literary tote, that I think I love so much because it's not white. It really stood out among the sea of plain canvas. 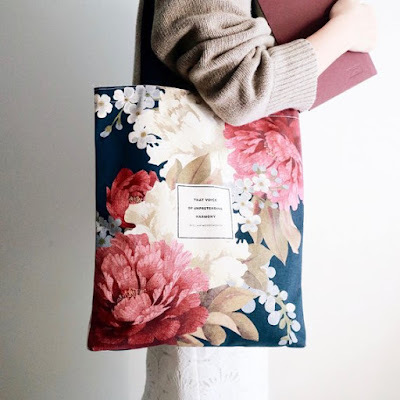 The beautiful floral bag has this quote by William Wordsworth on it, "That voice of unpretending harmony. "...so fancy. And it has POCKETS! Even fancier. You can find this at ObviousState for $24. I might be the only person who likes this, but as an avid Francophile, this one warms the cockles of my heart. It's says everything sounds better in french, doesn't it? I think it's funny, mainly because I'll buy just about anything with a french saying...or a french scene on it. I mean, y'all have seen my office in videos before! 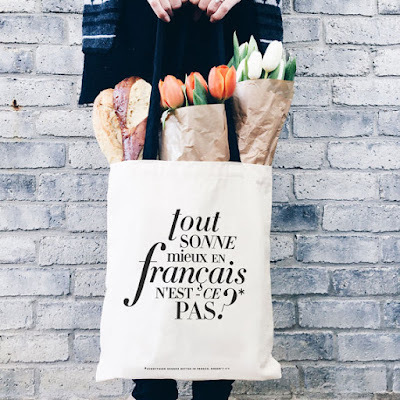 So to have a bag that basically says, I bought this sucker just because the writing was french, would make me laugh. And I would want to fill it with wine and baguettes. This is from the shop TheParisPrintShop, and sells for $24, on sale for $12 as I'm writing this. 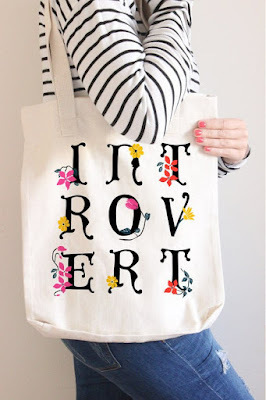 Okay, I probably don't need to say this, but I am not an introvert. If you self-identify as one, pretty please buy this tote bag, and send me a picture of your gorgeous self out shopping or something carrying this beautiful bag. 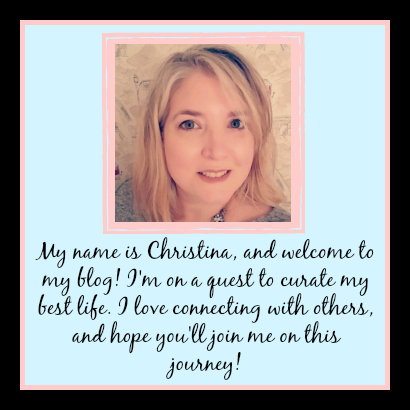 It has bold flowers, and a pretty font! You can find it at ColorMyEveryday for $22. This is one for all of my wino friends! 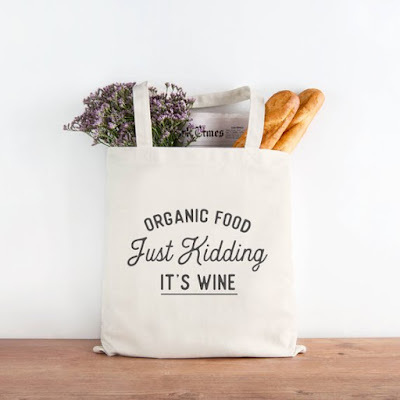 We can walk around the grocery store pretending our tote bag is filled with organic produce and healthy goodies, when really it's breaking our arms filled with wine. I see nothing wrong with this. This pretty tote is sold by MyPrettyPrint for $28. 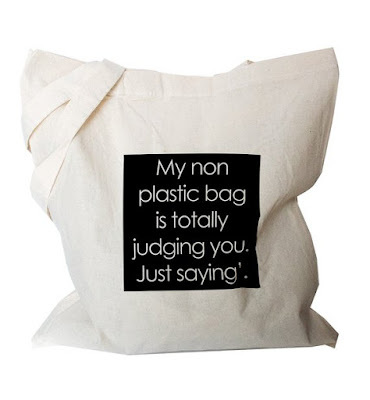 This bag is really just telling it like it is. I rarely remember my cloth bags, and feel terrible about it every time. But there's always that smug person with their arms full of cloth, who looks at you...and you know what they're thinking. 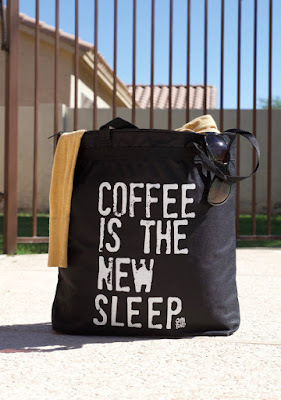 Maybe if I had this bag, I'd stop forgetting all the time. You can have this snark for $18.97 at BlackTypographic. And for our last tote, I have a black one...and it's ZIPPERED! Once again, the uses for this bag are numerous. The swimming pool, the beach, the library, the gym...anywhere you need a little more space. 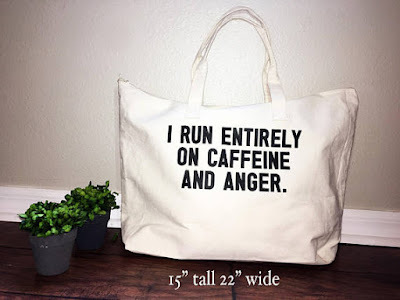 I know way too many people who will read this tote bag, and say AMEN. This one goes for $15 at StillRadClothing. Just for fun, I thought I'd throw one last piece of shopping goodness in here that isn't a tote bag. I spend way too much time on Etsy. You know I love a naughty coffee cup! My husband already thinks I own too many coffee mugs, and my daughter has a collection on the bookshelf in her bedroom. I know others have a worse addiction than I...so here's another one! I am completely enamored with the coffee cups in the Mugsby shop, and this particular one made me laugh. It goes for $12.99+. So there ya go!! I hope you like this shopping guide. I always have so much fun making these. As always, I hope you have a fabulous week. 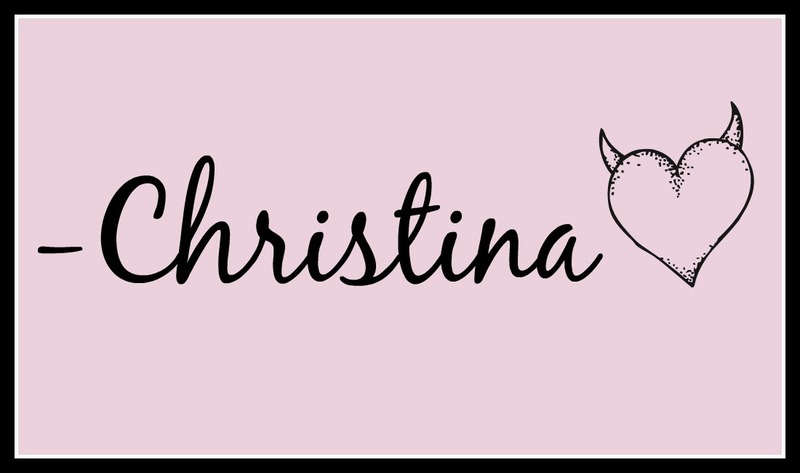 *All photos from the individual Etsy shops and owners. Affiliate Links Included in Post.